Looking for B.Ed. govt jobs? Have you completed your B.Ed. and are currently looking for the perfect opportunity to get employed in the govt sector? Then this is the perfect page for you. We have aligned for you the perfect list of govt jobs after B.Ed. which you can apply online for. The direct link to the application forms are also given on our site and you can apply for the posts of which the last date is not over. Banking, Defense, Railway jobs, Teaching, College, Financial Institutions, Universities & Schools, SSC, UPSC, Agriculture Jobs and many more opportunities are waiting for you. We have given the eligibility, age limit, application fee and procedure, salary scale for B.Ed. govt jobs in India. If you liked the selection of govt jobs in India which we presented before you then do not forget to subscribe to our website by entering your email address and also by bookmarking us to your favorite browser. 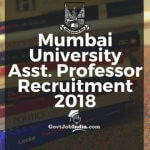 The Mumbai University has released its Official Notification for the Mumbai University Recruitment 2018 through their official website www.muonline.org.in.